Painted concrete can be beautiful--or not. Often the paint does not adhere or the finished product is not what the owner wanted. Outdoor carpet is an easy and attractive option to cover a concrete patio. Over the years, outdoor carpet has evolved from being offered only in a turf option to options as beautiful as indoor carpeting. Outdoor carpet is easier on the feet than concrete, and can turn a patio into a more pleasing outdoor living area. Measure the length and width of your area. Add at least 3 inches to each measurement to ensure you have enough carpet. Multiply the two numbers to get the square footage. Remove all items from the concrete. Clean the surface area with a strong detergent and allow it to dry completely. Allow the carpet to relax unrolled for at least one hour before installation. Apply adhesive tape around perimeters of the patio. Leave backing on the top-side of the tape, as you are not ready to apply carpet yet. Make large "cross" marks, 6 by 6 inches, every 2 feet on the patio. Center the carpet on the patio. Roll back halfway and remove the backing from taped "cross" marks. Replace the carpet. Press the carpet firmly to ensure adhesion. Roll back second half of the carpet and repeat the process. If you are happy with how the carpet is laying, remove the backing from the tape along the perimeter and place the carpet firmly. If you are not happy with the carpet, gently raise the carpet and set it straight before setting the perimeter. 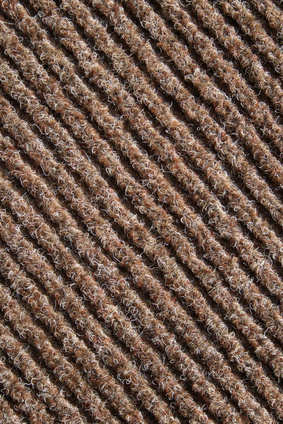 Place the carpet firmly against any area that must be cut out, such as doors and corners. Use your utility knife to cut along the cut-out area. Use your utility knife to trim the carpet around the perimeter. Walk gently, but firmly around your carpet to complete the adhesion of carpet and tape. Make sure the adhesive you have bought works for the grade of your concrete, and the amount of weather it will be subjected to.